An Emory education doesn’t always begin in a classroom. Sometimes, the teachable moments — the ideas that intrigue and inspire — emerge in unexpected ways, just waiting to be pursued and gathered, absorbed and developed. That’s the way it was for Linda Calloway, who would spin her interest in the conversations about literature, gender and ethnicity she overheard while working for what was then known as the Department of Women’s Studies into an Emory-based book club now celebrating its 10th anniversary. 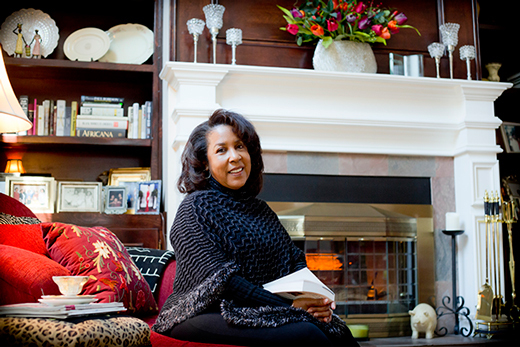 When Calloway retired in 2013, after 24 years at Emory, she briefly thought that she might relinquish the task of running a book club that focused exclusively upon literature by or about African American women. But the impulse didn’t last long. Instead, Calloway continues to serve as the group’s founder and de facto facilitator, helping scout locations for monthly meetings, handling communications and keeping track of books, both those they’ve already tackled and those that remain on the must-read list. Emory Profile doesn’t often feature university retirees. But through her ongoing commitment to the long-running book club, which still continues with an assortment of Emory employees, Calloway has maintained close ties to the campus and her alma mater — during her employment, over the course of 10 years she also earned an undergraduate degree here. 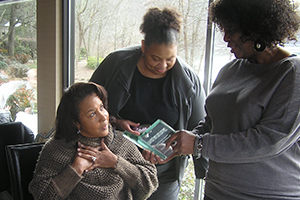 Calloway, herself a poet, recently put down one of the many books that she loves (see sidebar) to visit with Emory Report about how she came to create the African American Women’s Book Club (AAWBC) and what has kept it going for a decade. At their most recent meeting, members of the African American Women’s Book Club presented Linda Calloway with a plaque "in grateful appreciation" of her "vision, and devotion to African American literature." What was your inspiration for starting the book club? I had always wanted to be a part of a book club. While reading and perusing various texts about African American women, especially a wonderful pictorial entitled “The Face of Our Past: Images of Black Women from Colonial Times to the Present,” many of the photo captions read “an unidentified woman.” I would stare at those photos for hours and wonder “what was her story,” as I believe everyone has one. Zora Neale Hurston once wrote, “There is no agony like bearing an untold story inside of you.” So in an effort to try and “unearth” their lives and to somehow pay homage to all of the women who never got a chance to tell their stories — and perhaps to even help us better understand who we are as women — what better way to try and accomplish these goals than by reading and celebrating works that have been written by or about us? I was also inspired by doctoral candidates who would frequent (what is now the Women’s, Gender and Sexuality Studies office) during the summer. I would listen to a feminist exegesis on books by women authors — many whom I had never heard of — and was just intrigued by their discussions. Was that atmosphere part of what kept you in the department? Oh yes. I joined Emory in 1989 as a secretary, then became the undergraduate program coordinator, working with all of our undergrads, making sure they had all of their requirements for graduation, and just loved it. Usually during summer school, students would come into the office and talk to Fabienne McPhail (program development specialist). I would see them sitting in a circle describing these wonderful books — fascinating books I hadn’t heard of. And I found myself itching to go to the library and get them. How did you get your book group off the ground? It was an idea that I had tossed around for some time. Gerrian Hawes, who used to work here as a computer support person, knew a lot of people on campus. As she was out fixing computers, she would ask if they would be interested in joining a book club. I’ll never forget our first meeting – five women showed up, but we knew we were onto something pretty incredible. We were trying to come up with a name, and nothing seemed to gel. So we decided to make it very simple: the African American Women’s Book Club (AAWBC). It’s comprised of African American women who basically want to know more about their history — their foremothers, their lives and where they came from — by reading books written by and about African American women. 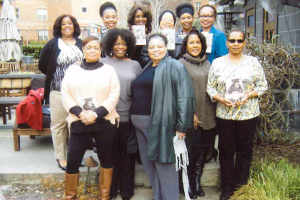 The African American Women’s Book Club recently celebrated its 10th anniversary. How has the group changed over the years? What has kept you going? The book club began with five members, but we have had as many as 28. Members have come and gone, but we currently have a core group of about 15 active, enthusiastic members mostly from Emory University and Emory Healthcare. Of course, we wouldn’t close the door to anyone! Our longevity can be attributed to our commitment to read, attend monthly meetings, participate in discussions, and host or coordinate a meeting. Members must commit to attend at least four to five meetings during the year. Another key to our success is that I think we genuinely respect and like one another and value each other’s opinions. It seems our bond strengthens each time we meet. We read books mostly written by or about African American women eight months out of the year, but we devote four months to reading works by male and female authors of diverse backgrounds and nationalities, as well as authors across the Diaspora like Buchi Emecheta, Chimamanda Ngozi Adichie and Junót Diaz. Our list of books has been pretty extensive, but a few favorite authors have been Toni Morrison, J. California Cooper, Diane McKinney-Whetstone, Bernice McFadden and Sandra Jackson-Opoku. We meet the last Saturday of each month at a restaurant or home of one of our members — we try to keep them as simple and stress free as possible, but some members create beautiful tablescapes decorated with props that are referenced in a particular book. Looking back, what pleases you about seeing the club reach its 10 year anniversary? When I came up with the idea of possibly starting a book club, I was very apprehensive. I’m daily thankful that I went ahead with it. Even the faculty were delighted that staff were getting together reading and studying and talking about books, often giving us suggestions. Beyond my love of books, this has also been about stepping outside of fear, not allowing fear to direct you. I decided that I was going to do this, no matter what. At least in doing it, you’re making that one step toward doing something. Editor’s Note: Those interested in joining the AAWBC are encouraged to contact Calloway at lcallow@emory.edu.